Sami is 22 years old. Nonverbal and developmentally delayed, she lives with her family in Westport. Her mom, Lori Leskin, heard about myTeamTriumph. That’s the program for children, teens, adults and veterans with disabilities who otherwise could not participate in endurance events like triathlons and road races. Volunteers “ride along,” helping them compete in — and enjoy — those endeavors. Last May, “06880” featured MTT in a story on STAR’s 5K Walk, Run & Stroll at Sherwood Island. Lori wasn’t sure if Sami would like being in a race. But she gave it a try. From the first moment, Sami loved it. She now gets very excited when she arrives at an event, and sees MTT’s red tents and racing chairs. 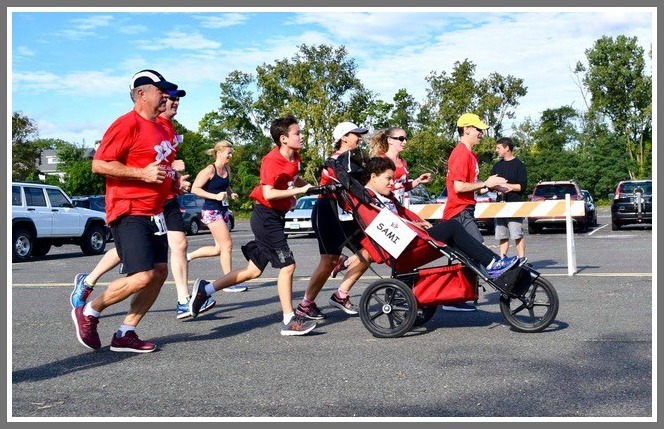 “She loves hearing her name yelled out when she’s on the course, and then coming across the finish line,” notes Curtis Lueker, a Westporter and myTeamTriumph’s Connecticut chapter founder. Recently, Sami competed in the Westport Tri — her first triathlon. MyTeamTriumph pulled her in an inflatable boat, then pulled and pushed her through the bike/run. … and finishing the water portion. “It was an amazing day,” Curtis says. 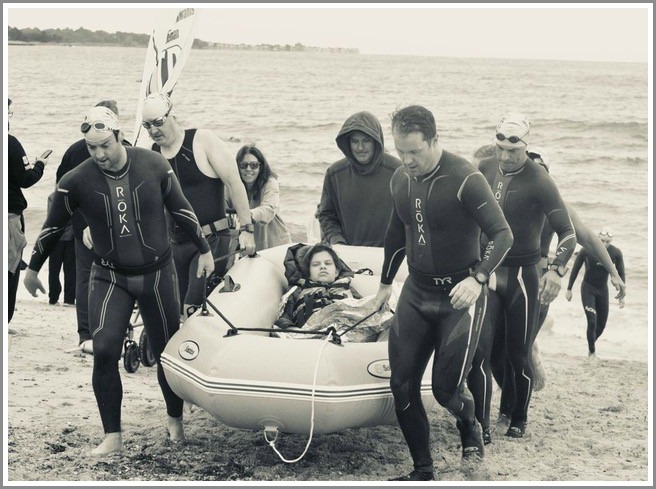 The highlight came when the team pushed her chair through the Compo Beach sand, crossing the finish line together. Sami has become a celebrity around town. People know — and admire — her accomplishments, thanks in part to Facebook. It’s a win-win-win: for Sami, her MTT team, and everyone cheering any race. This entry was posted in Organizations, People, Sports and tagged Curtis Lueker, Lori Leskin, myTeamTriumph, Sami Leskin. Bookmark the permalink. Curtis Leuker is one of the great men in our town! He has reached out to many organizations to find guys and girls like Sami, looking to find fitness, teamwork, and camaraderie in their lives. He selflessly looks for those he can lift up. Great work Sami and the world needs more Curtis Leukers. myTeamTriumph just completed our inaugural season in CT. If you know anyone who would enjoy an experience similar to Sami’s or if you’d like to help out either as a runner or volunteer, please check out our website at http://www.myTeamTriumph-ct.org and click “Get Involved” or email us at info@myTeamTriumph-ct.org. Wonderful story. Wonderful event. Brava, Curtis Lueker!